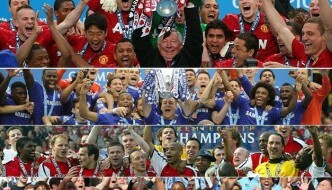 Premier League is widely considered as the most watched and powerful league in the world and in terms of revenue it has always overshadowed the likes of Bundesliga, Spanish La Liga and Italian Serie A. 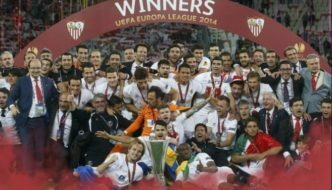 Today we take a look at top 5 most lucrative football league around the world and the list features all european powerhouse leagues. 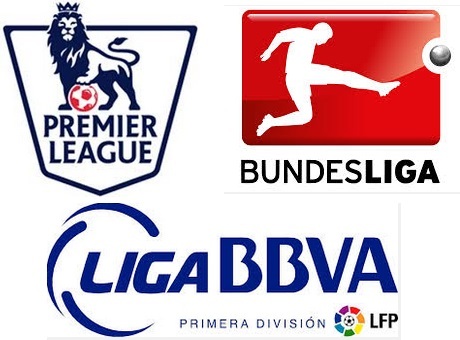 Premier League generate way more revenue than the other big leagues but when its come to profitablity German league is giving premier leauga a right run for money. In 2013 when we witnessed an all german final between Bayern Munich and Borussia Dortmund, Bundesliga were the direct beneficiary of the result and for the first time Bundesliga outnumber premier league in terms of profit. 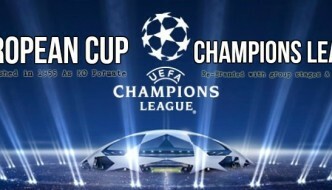 But the new premier league TV deal which bring in $9.4 billion over three years from 2013 to 2016 has put Premier League in a very strong position which means premier league clubs will be generating hell of a lot money compared to other European clubs. 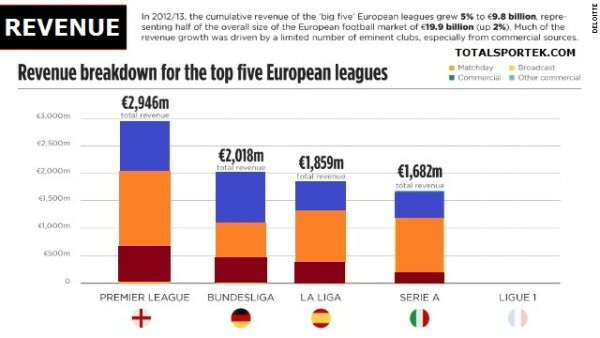 So lets take a look at top leagues around europe which generate the most revenue and the numbers like profit, wage bills etc. 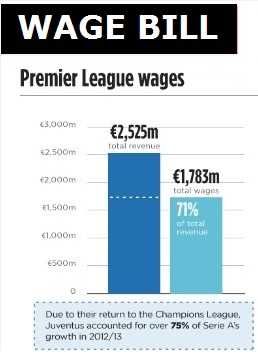 Wages-To-Revenue Ratio Comparison of Top Football Leagues ? Most of the revenue generated by the leagues is spend on players wages and Premier League lead the way where clubs spent around 75% of the revenue on players wages compared to Bundesliga’s wages-to-revenue ratio of just 51% and Spanish la liga where ratio is 56%. Premier League clubs can afford to spend more money on wages because of their increasing revenue due to Premier league lucarative TV deal. 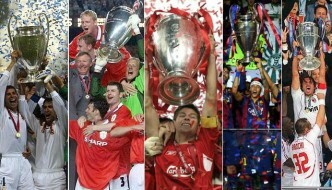 Where clubs get the equal share unlike other big leagues. In Spain Real Madrid and Barcelona can negotiate their own TV rights deal leaving other 18 clubs of the league struggling for revenue. 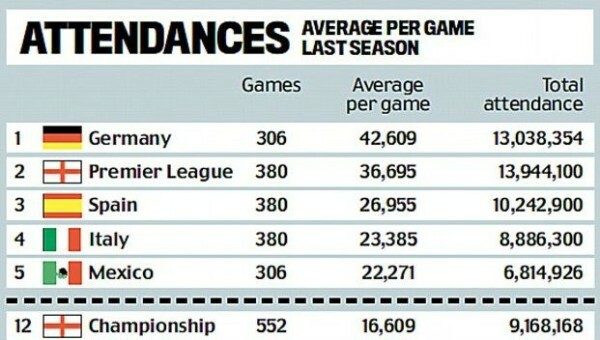 German Bundesliga has the highest league attendance compared to other major leagues around the world. The average attendance of a Bundesliga game is 42,609 fans per game which is largest by far, second postition is of Premier League where average attendance to a game is 36,695 fans, and these numbers does affect Bundesligas yearly revenue. In 2013-14 season Bundesliga generated more percentage of their revenue through matchday programme than any other league.